Bell Boeing V-22 Osprey a cross between helicopter and aircraft at Dubai Air Show 2011. 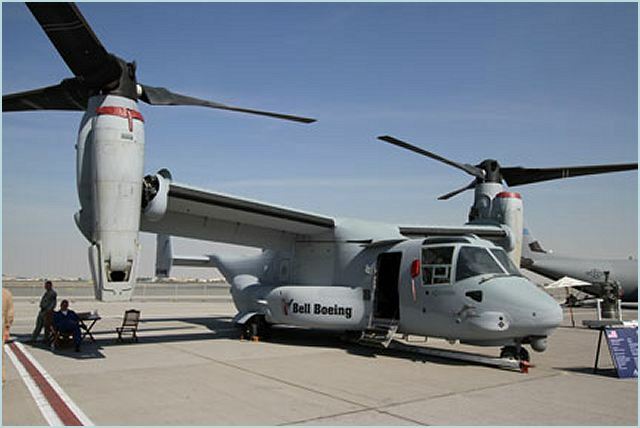 The Bell Boeing V-22 Program, a strategic alliance between Bell Helicopter, a Textron Company [NYSE: TXT] and The Boeing Company [NYSE: BA] announced that the V-22 Osprey titlrotor will be featured at the Dubai International Air Show in the United Arab Emirates from November 13 – 17. The V-22 Osprey is changing the way wars are being fought, due to its ability to deliver critical supplies and humanitarian aid in areas normally inaccessible to either conventional helicopters or airplanes. Already at 100,000 flight hours, it has proven to be one of the safest and most cost-effective military platforms. Bell Helicopter president and chief executive officer John L. Garrison Jr told Gulf News that the V-22 was making its debut here, and that the airshow is giving Bell Helicopter a chance to showcase the aircraft in the Middle East. The V-22 Osprey is a joint service, multirole combat aircraft that uses tiltrotor technology to combine the vertical performance of a helicopter with the speed and range of a fixed-wing aircraft. With its nacelles and rotors in vertical position, it can take off, land and hover like a helicopter. Once airborne, its nacelles can be rotated to transition the aircraft to a turboprop airplane capable of high-speed, high-altitude flight. The Osprey is currently flown by the U.S. Marine Corps and Air Force Special Operations Command (AFSOC) and the operational fleet has amassed more than 130,000 flight hours, nearly half of which have come in the past two years. A total of 10 Marine Corps and two AFSOC squadrons are operational today, and the two services have together logged 16 successful combat, humanitarian, ship-based or Special Operations deployments since 2007.